I absolutely didn't need to redo my nails at all but I decided to do it anyway. At first I was thinking about just doing black nails but then I decided that was a waste when I have so many lovely things to add to it! 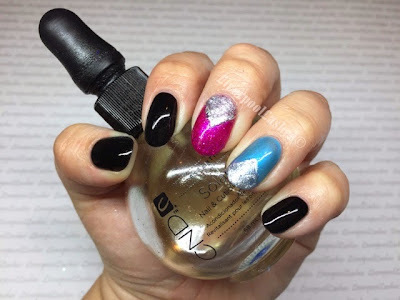 Eventually I decided to apply CND Shellac in Black Pool to my thumb, index and little finger. On my ring finger I applied the new Shellac shade in Lost Labyrinth and then on my middle finger I used Pink Bikini with Butterfly Queen over it. On the two brighter nails I mixed a glitter paste of Lecente Stardust glitter in Galaxy and painted triangles. I did actually use tiny pieces of silver foil around the edge of the triangles but you can barely see them - lesson learnt that I won't bother in future! Hope you like them! This looks great, I love the combination of the bright colours with the black. I've not tried CND before but it looks like they have some great shades. 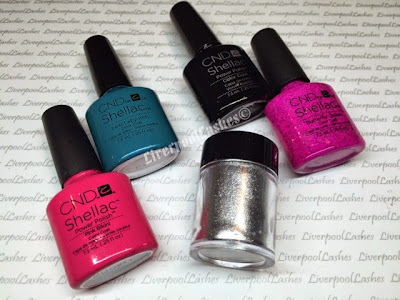 Sheer Shellac Shades - Resolved! Personal Post: Today Is My 30th Birthday!